Walsh is due to be back in action on Irish soil today at Cork Racecourse in Mallow. Ruby Walsh pictured at Punchestown on Thursday. RUBY WALSH ADDED another milestone to his decorated career as a jockey yesterday when he travelled to Far Hills in New Jersey. Stepping in for the injured Jack Doyle, Walsh rode the Cyril Murphy-trained Rawnaq to victory over two and a half miles in the US Grand National — a $350,000 race which is the most lucrative over jumps in North America. The result means Walsh has now won Grand Nationals in seven different countries, having previously done so in Ireland, England, Scotland, Wales, Australia and Japan. After flying across the Atlantic for the ride, Walsh is due to be back on Irish soil this afternoon, when he’s scheduled for four rides at Cork Racecourse in Mallow. Email “US victory means Ruby Walsh has now won Grand Nationals in 7 countries”. 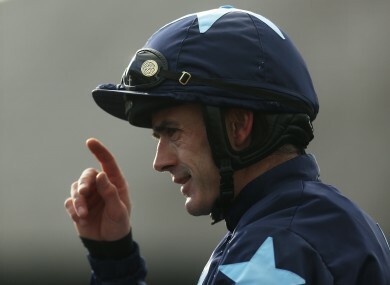 Feedback on “US victory means Ruby Walsh has now won Grand Nationals in 7 countries”.